Good morning everyone tomorrow were headed out on a Family Adventure Day, so I wanted to bake some cookies for the trip. Where are we headed you ask? well we are going to Dinasaur World and Fossil Rim Wild Life Center in Glen Rose. Since we cant see everything in one day we are planning on making it an overnight trip. We will be staying at the Best Western Dinosaur Valley Inn & Suites. The kids are so excited. We love taking little family day trips they are so fun when you want to get away and so something together. We got a great all in one deal on a mini suite and passes for Dinosaur World. Plus when we visit Fossil Rim Wildlife Center we get 50% off daily admission with our yearly zoo pass, so it really is a fun and affordable little get away. Well, when you have a road trip with kids you need snacks. So I made one of my favorite cookies to along on for the ride. Peanut Butter Cookies are on the top of my list as on of my favorite cookies. But instead of just making plain peanut butter cookies I took them over the top and added Resee's pieces to the cookie mix. Usually I just add what ever I have on hand, peanut butter chips, chocolate chips, combination of both or Reese's pieces. I can say that Resee's has to be my favorite addition to peanut butter cookies so that's usually my first choice. I am sure this recipe isn't anything new, but I wanted to share it with y'all. This will probably be my last post until Wednesday so I'm taking a we bit of a bloggy vacation. We plan on finding a nice place to have dinner together, so I am excited that I don't have to cook. There is a restaurant in Glen Rose called Two Grannies Down Home Cookin. I was so excited to have a chance to visit and enjoy a meal, but they're only open Thur - Sun. We're leaving on Tuesday. so we will have to make plans to visit another time. It really does sound like my kind of place. I hope you enjoy the cookie recipe. Here are a few step by step photos. Cream the butter and then add the sugars. Cream the mixture again and then add the dry ingredients. 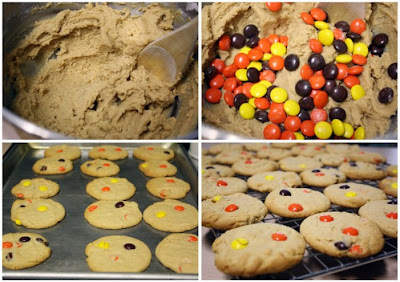 Add the Reese's pieces last and mix to combine. Chill the cookie dough (I chilled mine about a hour). When ready to bake use a small cookie scoop and scoop out the cookie dough and shape into 1 1/4 inch balls. Place on a greased baking sheet and flatten down a bit. You can add a few more Reese's pieces if you like. Bake at 350 F until lightly brown about 9-10 minutes. Cool on baking sheet and then transfer to a cooking rack to cool completely. Get a big glass of milk and enjoy!!! Cream the butter and then add the sugars. Cream for 2 minutes. Mix in the peanut butter and egg. Mix together the dry ingredients - flour, baking soda, baking powder and salt. Stir into the sugar butter mixture. Add the Resees pieces last and mix to combine. Wrap the dough in plastic and refrigerate at least 2 - 3 hours. (I can never wait that long and usually just chill for about a hour). Preheat oven to 355°F. Shape dough into 1 1/4 inch balls. Place about 3 inches apart on greased cookie sheet. Flatten down a bit before baking. You can add a couple more Resees pieces if you like. Bake until light brown, 9 to 10 minutes. Cool on baking sheets for a couple minutes; transfer to rack to cool completely. 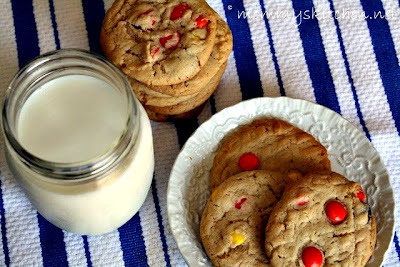 For chewier cookies, bake at 300°F for 15 minutes. Those cookies look delish! And your trip sounds fun, Have a great time! When the little two get older we're going to have to make this trip...I remember the dinosaurs from when I was little:))) Have a blast! Wow, that would be another unforgettable adventures with your kids. Peanut Butter Cookies look really good. Have Fun! Those cookies sound delicious. My boys love Reese's Pieces so these would be right up their alley. Have fun on your trip. Peanut butter, chocolate chip cookies are my absolutel favorite. it never even occured to me to use M&Ms. Where have I been?!?! These look YUMMY!!! 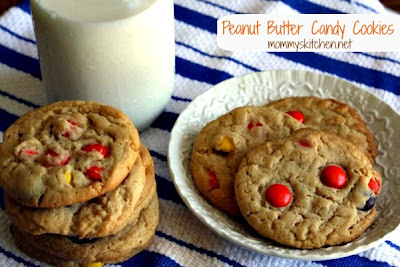 Ooh I've got to add reeses to my next batch of PB cookies! Yum! I posted my Peanut Butter and Oatmeal Double Chocolate Cookie Sandwiches...I combined a couple recipes to make these. Mr. LOVED them! I love reeses pieces! 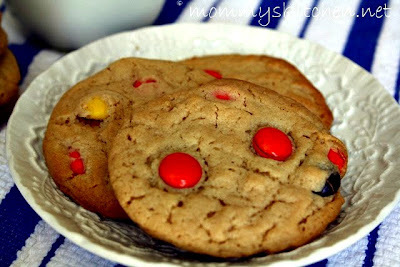 These are on my to be baked list! Those look so good and what a fun trip!